These are fun for parties, or a nice tasty snack to share with friends and family, a delicious alternative to traditional hot dogs! This recipe will make 12 Hot Dogs on a stick with the Retro Diner Stick Snack Maker. 1. Beat the eggs and milk together in a large mixing bowl. 2. Sift in the flour to the bowl, add the salt and pepper, and mix until a smooth batter has formed. 3. Next cut each of the frankfurter sausages in half and thread half a sausage onto each skewer, leaving 1cm of skewer sticking out at the end that will sit towards the middle of the machine. 4. Once your Stick Snack Maker has pre-heated coat each cavity with an oil spray. 5. Add a desert spoon sized amount of batter to each cavity on the bottom baking plate. 6. 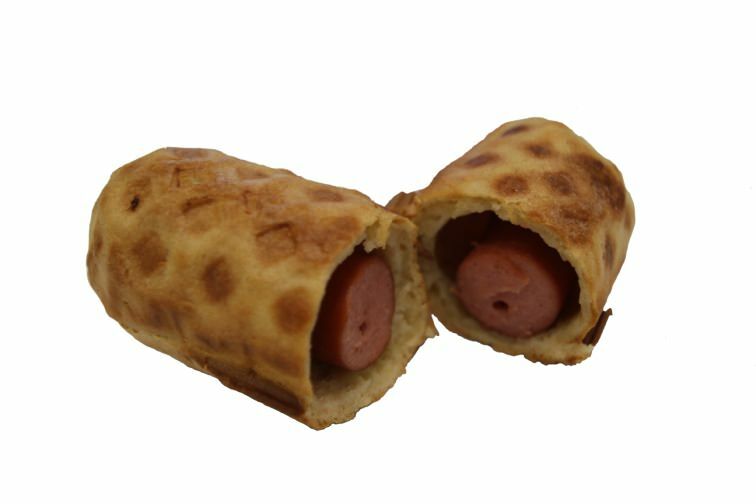 Quickly place one stick (with the half frankfurter) into each cavity, you have to move fast as the base of the hot dog will begin to cook immediately. 7. Finally add another dessert spoon sized amount of batter over each sausage before closing the machine. 8. Check the hot dogs after 5 minutes, you can test to see if the batter is ready by inserting a toothpick into the middle of one, if it comes out clean they are ready. If not simply close the machine and leave them to bake for up to an additional 3 minutes. 9. Once the hot dogs are ready, switch off the machine, leave them for a minute before carefully removing and starting the process again with the rest of the mixture. 10. Serve warm with a selection of ketchups and mustards and enjoy!